The Talent Search is the South African version of the Bebras Contest which attracts more than two million participants in the rest of the world each year. The contest requires the use of Computational Thinking – those skills that are also required for Mathematics, Science, IT and Computer Applications. The Talent Search identifies learners with the skills, but at the same time gives all an opportunity to develop these skills. The Talent Search is an online test, but for those schools with inadequate connectivity a pen-and-paper version is available which does not require computers. After the Talent Search, learners who have already mastered a computer language can enter the Programming Olympiad. Those who know how to use applications like spreadsheets, databases and a wordprocessor can enter the Applications Olympiad. ** The Talent Search is available as an online test for those schools with adequate facilities. ** For schools lacking facilities, it is available as a pen-and-paper test. ** The Talent Search itself is an aptitude test with no further rounds. ** However, learners who are familiar with Wordprocessing, Spreadsheets and other applications, should enter the Applications Olympiad. ** Learners who are familiar with a programming language should enter the Programming Olympiad. 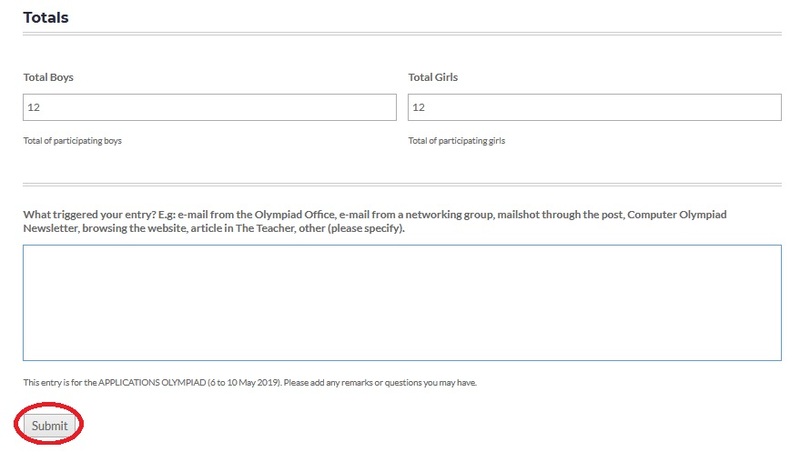 ** There is no requirement that Talent Search participants should enter either Olympiad, nor is there a requirement to do the Talent Search before entering either of the Olympiads. ** The school may not use the Talent Search paper before the announced date, but may use it on any day of the Talent Search week. ** As the principal and the teacher are the ones to sign the certificates, it is up to the school to make sure that results are obtained honestly. ** Learners may only participate under supervision of a professional teacher. ** One teacher at each participating school must be the contact for the Talent Search. ** The tasks may be completed in any order. 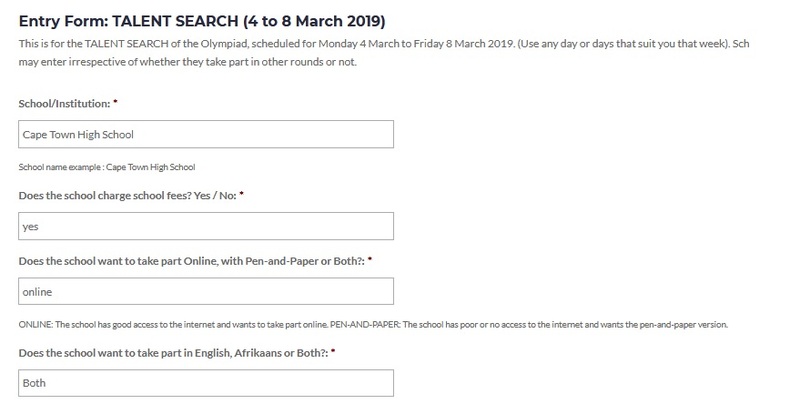 This is for the TALENT SEARCH of the Olympiad, scheduled for Monday 4 March to Friday 8 March 2019. (Use any day or days that suit you that week). Schools may enter irrespective of whether they take part in other rounds or not. ** Enter the following details ,to fill the entry form. Section for Talent Search entries in grade 5 and below. ELEMENTARY learners may write as individuals or in a team of two. Individuals who do well will get certificates with their names on. Teams that do well will get a certificate with their chosen team name (but no learner names). Step 9 : Enter Number of participating teams of two in grade 5 and below. Later you will receive instructions about how to submit the team names. Step 12 : Click on Submit Button. It is free. Irrespective of the number of entries or the status of the school, participation in Talent Search is free. May primary school students participate? Yes. There are two age categories for Primary Schools and three age categories for High Schools. May home-schoolers participate in the Talent Search? The contest has to be written at a school under the supervision of a qualified teacher. Certificates are issued in the name of the school and are signed by the Principal and the Teacher. Home-schoolers could approach a school in their area and if the school is not yet registered with the Olympiad, encourage them to register, and request permission to participate at that school. Do we need a computer? Only for online participation. The pen-and-paper version does not need access to computers. Anyone, who in the opinion of the school, should take part. All learners will benefit from the exercise in computational thinking.